WordPress Subfolder Installation To Root for Pre-existing Installation explains how easily you can actually change the URLs from you previous subdirectory. WordPress Subfolder Installation To Root falls among Moving WordPress documentation in official WordPress.org website. As it appears, new users who probably with little understanding wrongly or deliberately installs WordPress on subdirectory like /blog/ or /wordpress/ when wants to move one level up works more than actually needed. Those who are not aware of who is Matt Cutts, can search the web for details. The basic thing is that, probably Matt wanted a static custom home page and blog on the sub directory. Although actually it is not needed, with WordPress we an create a Static page; it was intentional. Take that he decided to move the WordPress Subfolder Installation to root, that means WordPress URLs will be without the /blog/ part in url. Basically three steps. The official documentation too complex to understand because of a kind of roundabout language. This sub-directory can be /blog (in case of Matt Cutts in example) or anything like /wordpress. Second there is need of an .htaccess file, which is used for pretty link / permalink structure and other plugins like WorsPress Cache Plugins. Copy (not move) the .htaccess file from the subdirectory of the WordPress installation to the root of your website. WordPress Address (URL) means where the files of WordPress are located. Site Address (URL) means what will be displayed to the public. As basically the URL are virtual, it works very easily. Go to the Settings > Permalinks settings and just click the button to update your Permalink structure. This actually writes the .htaccess file properly. You have to update WP Super Cache or WP Total Cache if the settings was for mod_rewrite. XML Sitemap url also needs to be changed. If you repair the database selectively in the way we wrote for database repair and later change in this way, you can basically repair your working website without any interruption or downtime. This Article Has Been Shared 2660 Times! 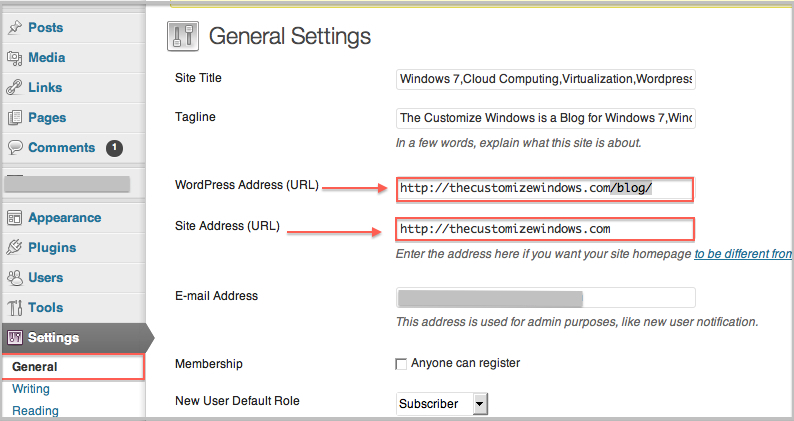 Cite this article as: Abhishek Ghosh, "WordPress Subfolder Installation To Root for Pre-existing Installation," in The Customize Windows, December 27, 2012, April 20, 2019, https://thecustomizewindows.com/2012/12/wordpress-subfolder-installation-to-root-for-pre-existing-installation/.